Police are hunting for ram raiders who have stolen a cash machine from a convenience store. 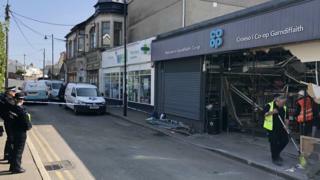 Gwent Police said three people were thought to have been involved in the theft at the Co-op shop in Garndiffaith, near Pontypool in Torfaen. It is understood that a 4x4 vehicle was used to smash into the store at about 02:40 BST on Monday. A digger may then have been used to pull the cash machine free. A Co-op spokesman said the store remained closed following the attack. He added: "It is too early to confirm when the store will re-open, as we await the outcome of structural assessment."